Known for its color and high quality, the stone mined at Colorado Flagstone meets all ASTM standard specifications for Quartzitic Sandstone. This stone has been mined from our unique stratified formation since 1887. Colorado Flagstone is located in north central Colorado, approximately 5 miles west of downtown Loveland and one hour north of the Denver Metro area. 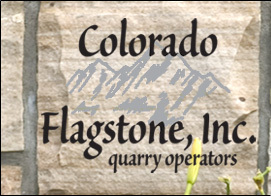 Colorado Flagstone's quarry provides easy access to major highways. This location helps to make our product accessible and competitively priced. View a map of our QUARRY LOCATION.